'Ludes are not a popular drug any more, nor are Preludes popular cars – at least not at Honda which stopped making them some time ago. Today's Nice Price or Crack Pipe Si is from back when they did, and it has 4WS too. Will its price however, prove a worthy prelude to purchase? Among the great debates of the ages - great taste/less filling, tightie whities/billowy boxers - you can add the desirability of yesterday's 1998 Mercedes E320, which was claimed to have some Brabus bits appended to it. That debate extended to its price, however in the end, it came away a 56% Nice Price winner as the likes slightly outweighed the no-likes. 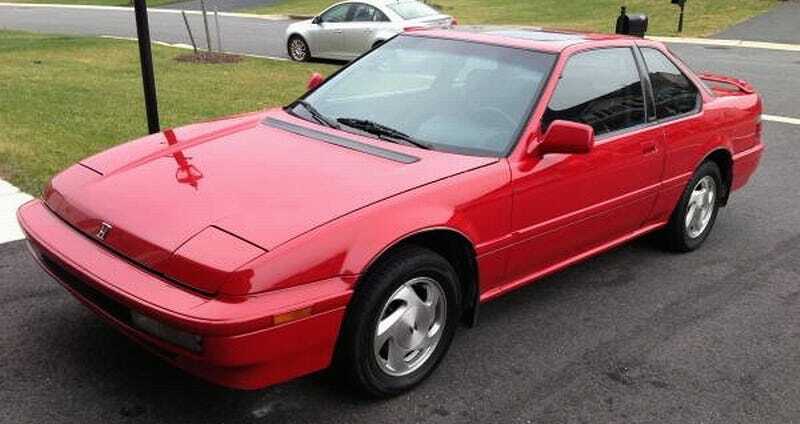 There should be no debate over the likability of today's 1991 Honda Prelude, I would imagine. Honda's entrant in the '80s/'90s FWD coupe wars has always been well regarded -as far as such things go. FWD sporty coupes were all the rage back when MTV played music videos and tweeting was just how little kids farted. Honda's first stab at the sporty coupe market arrived in the form of the '78 Prelude which shared its suspension with the Accord, and its styling with boredom. The second generation Prelude was both better proportioned and featured larger engines to better account for its sporting pretensions. By the third generation, the Prelude offered evolutionary styling changes from before, keeping pop-up headlights and a jaunty jump in the mid-car beltline. It also offered some pretty cool options. This '91 comes from that generation's final model year and like most Honda product of the era acquits itself pretty well stylistically. These cars looked good then and still do now. This one is red, which along with white seems to have been the most common color these cars carried. That paint is a respray, as noted in the ad, and one that is now showing some signs of wear. The interior of the car seems to be in nice shape, although the only look at it we get are in a shot of the back seat - almost never used in these cars owing to their cramped dimensions - and one of the center stack and 5-speed stick. Being an Si, this Prelude should rock the 140-horse B21A1 DOHC four, and the ad notes major maintenance having been undertaken on the mill in the past two years, which included the timing belt. I don't remember if these are interference engines, but even if not, a broken timing belt can ruin your whole day. One of the cool features that this Si possesses is 4WS. It's a mechanical system with a long shaft running between the front and rear axles and actuating a hypocycloid gear steering box for the rear wheels. Rear steering angles depended on those of the fronts and the whole thing made for excellent handling. At least according to the Road & Track road test of the day. Speaking of excellent, the ad for this Honda does just such a job of explaining the car's strengths and foibles, as well as its history. At least as known by the current owner. Among the issues it details are some oil usage - common in older Hondas - and some finicky A/C controls. Other than that the car seems to be in excellent (there's that word again) shape for 231,000 miles. The question for today however is whether it's in sufficient shape to account for its $3,000 price tag. These aren't all that common these days, and this one, being entirely stock seems to be a great example of the breed. What's your take on $3,000 for this Si? Is that a price that might make you consider it? Or, is that amount a prelude to a miss? Baltimore Craigslist, or go here if the ad disappears. H/T to MC Hammer for the hookup!